We’re continuing our series on the principles of persuasion — coined by Dr. Robert Cialdini in his book Influence. If you missed episodes 70–74, you *may* want to start with those as I’m doing a seven-part series on persuasion. When you match up the principles of persuasion with your marketing funnel, you can create a profit engine that attracts clients, students, and customers for years to come so that you get business results without worry. In his book, Cialdini explains the psychology of why people say “yes” and how to apply these principles in your everyday life to persuade people. 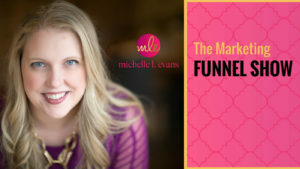 Today, we’ll tackle principle #6 and apply it to your marketing funnel because it will make a huge difference in how effective your marketing funnel actually is for your audience and your own results. Scarcity — aka fear of missing out, exclusivity, limited time deal, while supplies last, first 20 buyers only, limited to four per buyer…you get the idea. We’ve all seen it, and fundamentally, it’s all about one thought: If your thing is hard to get OR in great demand, it MUST be worth something. Scarcity is one of the principles I’ve struggled with the most because I've seen people misuse it on their audience so badly. Scarcity definitely works, and even though others misuse it, this doesn’t mean we should be scared to use it ourselves. Compared with the other persuasion pillars, this one is probably the easiest and fastest to put into place, and it can be really effective when you know why you’re using it and how to use it without angering your audience. 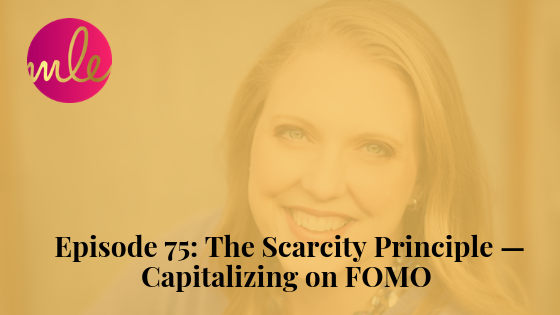 When you use scarcity the RIGHT way, it can be a great gift to your audience because it forces them to make a decision. It doesn’t let them just “think about it” for a long time, but instead, it makes them dive in headfirst to say YES, this is for me or NO, this is not for me. It makes them choose an answer. Limbo land is the most awful place to be, and sometimes, we just need a bit of scarcity and urgency to get us to make a decision. Scarcity Tactic #1: Only X# Left! Amazon, Expedia, Lands End, Zappos, and Target (online) all do this really well. You search for the perfect item, find it, and you see the big “ONLY 3 left” — usually in bold red type so you can’t miss it. We don’t want to miss out, so we run to get what we want before someone else can take it. You can see this is a very popular tactic used by travel sites like Expedia, Booking.com, Hotels.com, Trivago and others. They show how many rooms are left for some hotels or at certain rates, so you feel the pressure to hurry and book your room right now. To play up the scarcity game, they also indicate how many people are currently viewing the same hotel, so you feel like you’ve got to act even faster because one of those other people may swoop in and steal your deal. Remember, like 100 years ago, when Gmail first came out, and you needed an invite to get an account? Or when Facebook first launched, and you needed to be a college student at only a handful of colleges WITH a college account to get an invite to join? That’s the invite-only tactic in action. When you know not EVERYONE has access to this product, program, service, or experience that you do, it makes it seem more special, unique, and often, more desirable. It can be a really effective strategy when rolled out well to make your audience feel either part of an exclusive club OR act as a gleeful early ambassador that evangelizes your brand to spread the word about your offer. Whether you have a deal of the day, like Amazon, or you’re running a limited time promotion on a product, program, or service you offer, it has one big thing going for it when done right: when it’s done, it’s done. That’s why you see people running big specials for Black Friday or Cyber Monday. It’s also why people run limited time launches — with or without a discounted price — for a product, program, service, or event. A lot of times people use timers on the sales pages and even in their emails because the big emotional push with this tactic is that time is literally running out -— when that clock strikes midnight, no more offer. If you decide to do this one, be sure to make it exceptionally clear to your audience when the offer expires. Use something like a timer to countdown to your offer expiring so that people know: It’s time to make a decision NOW! For some businesses, it makes sense to create a limited number, limited time, or BOTH limited number and limited time offers. A one-of-a-kind offer is something that is exclusive, limited and requires your audience to make a decision if they’re in or out. Often, these types of offers are seen as extremely valuable because it’s something no one else can buy/experience again in the same way ever. We’ve probably all participated in an eBay bid, and that process itself incites competition. It taps into people’s desire to own something exclusive and to beat out other people within a very specific bidding window. James Wedmore does this well on Instagram. He’ll run competitions where you can win things, like an all-expenses-paid trip to his BBD live event, by going to Instagram, finding a specific post of his, and following the instructions. People go bananas to out-perform one another to get more entries and have a higher chance to win — and James wins because more and more and more people are talking about him, his podcast, his business, and his event. You might not be at the point of giving away an all-expenses-paid trip, BUT could you give away a call? Or something smaller? As humans, we are always drawn to things that are exclusive and hard to come by. Scarcity works so effectively because we’ve evolved to assume that things that are difficult to obtain are usually better than those that are easily available. We link availability to quality. We tend to attach more value to things that other people are competing for, a phenomenon that is part of social proof. There are five main methods to trigger the scarcity principle in your audience — and you DO NOT need to use all five; you just need to use at least one in a way that feels authentic and right for you. Want to know which marketing funnel is right for you and your business? Take this free and easy quiz, and in less than 5 minutes, you’ll know EXACTLY which funnel is right for you.